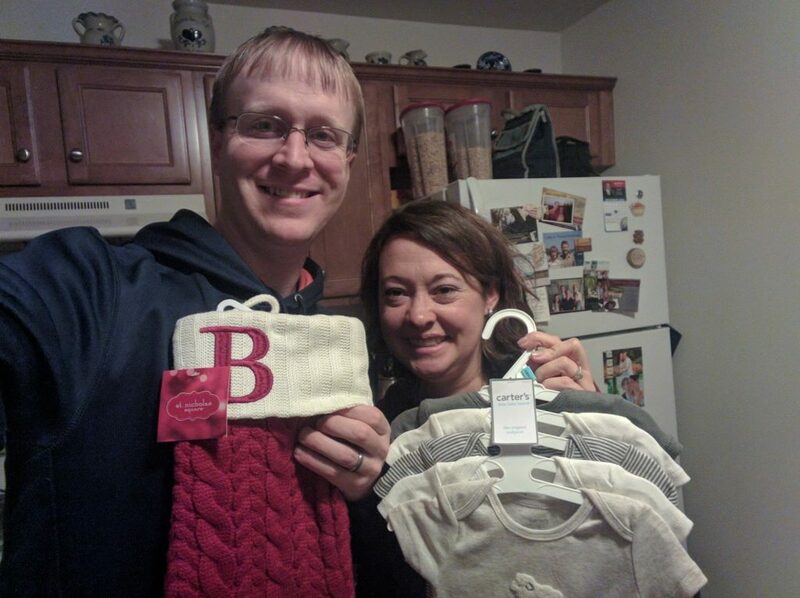 God is growing the Marks family in a very special way! Adoption is a big part of our lives, especially since we have several family members who are adopted. Dan has 3 adopted siblings (2 sisters who were adopted as infants & 1 brother who was adopted as an older child), as well as a cousin who was adopted internationally. Rachel’s mom was adopted as an infant by family members. Even though adoption is something that we always wanted to do at some point in our lives, God has been working in our hearts and leading us to adopt now, especially since we are still waiting to become pregnant again after losing our baby boy who was born at 19 weeks in July 2013. Since our baby was due at Christmastime, we decided to name him Gabriel, which means “God is our strength.” We have truly found our hope and strength to come from God alone as He has shielded our hearts in such a tragic storm that no parent should ever know. It’s been a hard journey, and some days are easier than others. But we know beyond a doubt that God has a perfect plan in all of this and that we WILL see our baby again in Heaven. We are comforted to know that Gabe is safe with Jesus who will take good care of him until we can all be together in Heaven someday. Yet our hearts still ache to be parents again this side of Heaven. Since we didn’t have any trouble getting pregnant before we lost Gabe, we had hoped to have another baby soon afterwards. After going through various fertility consultations, tests, & procedures over the past year, we met with a specialist who recommended 1 more test – which showed that Rachel had scar tissue from our miscarriage that would prevent pregnancies & needed surgery in September. While it was disappointing to hear this information 2 years after our miscarriage and that surgery was necessary, we are thankful that everything went well and that our chances have increased for having children naturally in the future. Like the angel Gabriel, our Gabriel’s message is that Jesus loves the little children and died on the cross to make a way for us to know God and be with Him forever. And we want to share God’s love, joy, and comfort with a baby who otherwise might not know what it’s like to grow up in a loving Christian home with two parents who love the Lord. In May 2014, we attended an informational meeting but left feeling very discouraged about the costs. We knew God was still calling us to adoption and decided to move forward. We began working with an adoption agency and worked very hard to complete all of our paperwork so that we could finish our home study by the end of the summer. Two days before our 1st interview and when our 1st payment was due, however, we found out that there were several policies that we were not previously informed which we could not agree. Since we were unable to continue working with that agency, we decided to take some time to think and pray about further pursuing adoption at this time and to look into other Christian adoption agencies. One of Rachel’s childhood friends said she & her husband used COBYS Family Services in Lancaster. Upon researching this agency and contacting employees, we were very impressed with their biblical philosophy, clear policies, & lower costs. In October & November 2014, we completed our interviews & home visit. We sent out a mailing of 400 prayer letters to friends & family. In January 2015, we fulfilled our 10 hour training requirements using “The Heart of the Matter” online course. In February, we had a final meeting with our caseworker to review our training, which was needed to complete our home study report. Our March 16, 2015, our home study was officially approved by COBYS! While we love working with COBYS, they are a very small agency in PA and do not oversee many infant adoptions. After applying for many grants, we began researching other adoption agencies and facilitators to gain more exposure to birth parent situations. A friend sent us information for the Adoption Center of Hope, a Christian facilitator in CA, and we decided to partner with them the end of August 2015. Our profile has been shown several times, and they are currently working with several expectant mothers, although we have not yet been matched. Since our adoption will most likely occur out of state, we will have higher fees than we originally anticipated because of agreement, matching, & placement fees, in addition to travel/lodging, birth parent expenses, and legal fees. 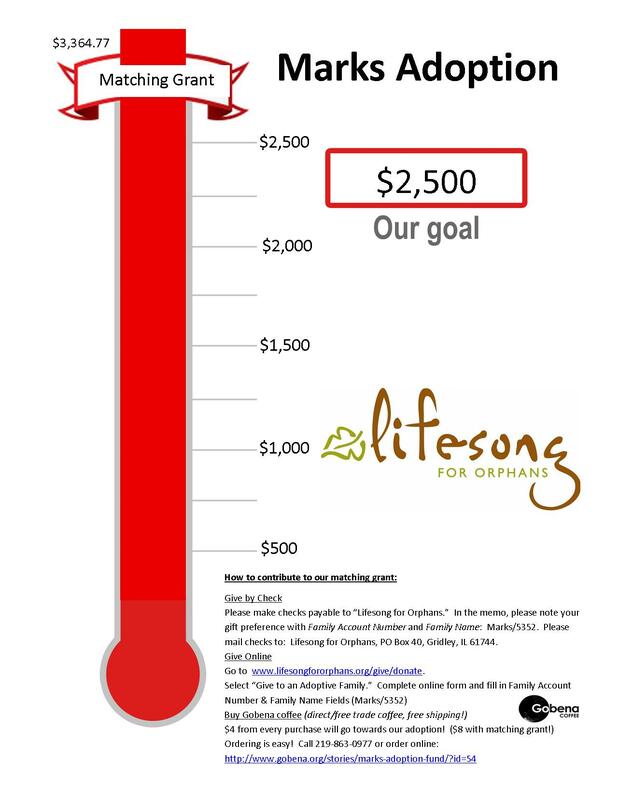 We are so grateful to have received a $2,500 matching grant through Lifesong for Orphans! Several friends have done personal fundraisers for us, and we are also partnered with Gobena coffee. We have been so blessed to have the support, encouragement, and prayers of so many family, friends, & church. We cannot wait to see how the Lord will grow and bless our family and cannot wait to tell everyone what He has done! You can give online, but please note that STRIPE does charge an administrative fee (2.2% +.30 USD per transaction). Your donations will be decreased by this amount. You may also send a check payable to “Lifesong for Orphans”. In the memo line please write “Marks 5352”, to ensure it is credited to our account. Please mail to Lifesong for Orphans, PO Box 40, Gridley, IL 61744. Lifesong has been blessed with partners who underwrite all U.S. administrative and fundraising costs (TMG Foundation and other partners). That means 100% of your donation will go directly to the adoption. Our adoption journey has changed greatly last week. Please continue to keep us in your prayers, as well as the birth parents & their families. Pray for baby & parents to know Jesus as their Savior, as well as for safety, care, & provision. And please pray for the maternal grandparents, who we know & love, as they struggle during this time to find peace & rest in the Lord. Yesterday our lives changed forever. While we were sitting in church waiting for the sermon (about God’s provision) to begin, we noticed our phones were vibrating & that we had a missed call. Dan left the sanctuary to see what was going on, and when he didn’t come back for a while, I began to think that something very wrong was happening. After what seemed like forever, he came back into the sanctuary & motioned for me to follow him. As soon as we left the sanctuary, he pulled out his phone and, with no words needed, showed me a picture – of our little boy who had just been born! I apologize to anyone in the back of the sanctuary who might have heard me crying. We finished out the morning sitting in a little room off of the sanctuary crying, praying, texting family, and getting more details about the birth. Benjamin David Marks was born on Sunday, March 19 at 11:53 am! Ben was 19 inches, 5 lbs. 15 oz. Baby & birth mother are doing well after a quick, unexpected delivery (with only 15 minutes or so of hard labor) and will be discharged on Tuesday, when we will meet Ben for the first time & take him home. He is a beautiful, healthy little boy, and we are already in love with him; we have seen several pictures & had the amazing privilege of face timing with the birth mother and Ben, who was fast asleep. We cannot thank you enough for your love & support throughout our adoption journey, and we hope you will continue to keep our family, as well as the birth family, in your prayers. We look forward to spending the next several weeks at home together as a new family and would appreciate your prayers for wisdom & guidance, patience & peace, especially during the 30 day revocation period for parental rights. Today is not what we expected. While nothing in this life is certain, we had thought that our long-awaited journey was nearing the end & that we would finally see the blessings that God had in store for our family. Those blessings are still out there somewhere, but today is not that day. 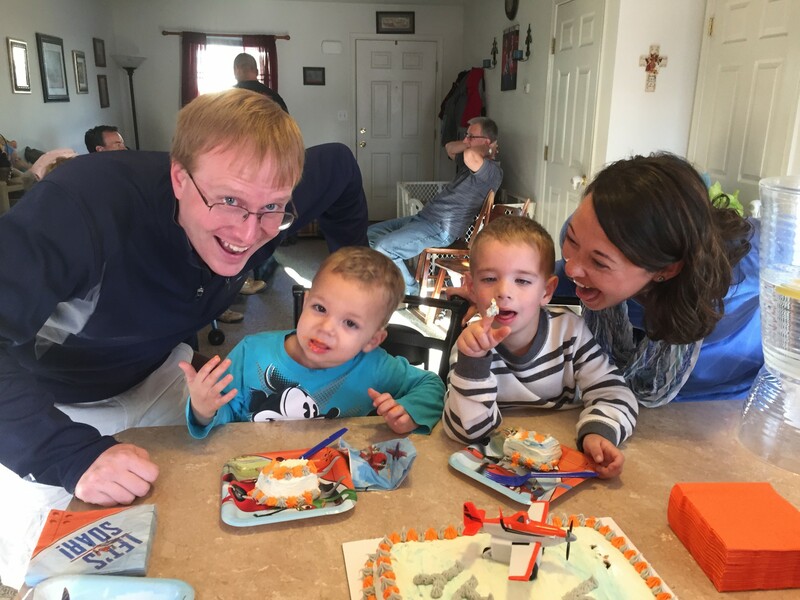 While any adoption this side of Heaven holds many unknown factors & uncertainties, we were confident that ours was moving ahead as details unfolded in many promising ways, but much has changed. Within less than 24 hours of Benjamin’s birth, we heard there was some uncertainty yesterday with the birth father. We spent much of the day not knowing what would happen, but we held on to hope that we would still be able to bring a baby home soon. Around 6 pm, we were finally able to talk directly to the birth mother. Both parents had changed their minds because of new circumstances. Besides falling in love with a very beautiful baby boy, the father’s extended family suddenly heard about the pregnancy & baby and offered support so that their family could parent the baby. We are crushed and broken as we truly felt this was the door that God had opened for us. We saw pictures. We face timed with the mother & baby at the hospital. He wore the little hat that matched the outfit that he was supposed to wear when he came home with us today. We had a nursery that is ready & prepared. Our hearts and home were ready. And we have no answers, just empty arms. We don’t know much of anything right now: We don’t know why this happened so suddenly; we don’t know how things could have changed so quickly; we don’t know what the next step is for us; and we don’t know what God has planned. I don’t know how I will answer the little girls in my Awana group or how we will explain any of this to our nephews because all of them were so excited that Baby Benjamin was coming home. All we know is that God is still good; He is always faithful. And He knows our hearts and sees our tears. I am thankful that our adoption into God’s family is never broken. I do know we are not the only ones hurting. Besides so many of you, our friends & family who have faithfully prayed for us, we cannot help but feel sorrow for the birth mother’s family, who have become dear friends to us. They have prayed for us for a long time & have been such an encouragement to us, especially over the last 4 months that we were matched with their grandson. We love them. We do not blame them or hold them accountable in any way. We hope you will pray for their peace and comfort as well. And we pray that this little baby boy, who we had named Benjamin David but now goes by another name, will know that he is beloved of the Lord. We pray for his safety in these crazy circumstances and uncertain future. We pray he will be loved and cared for in the way he deserves and that God would protect him. But most importantly, we pray for his salvation – that God would draw him to Himself at a young age, despite whatever else may happen in his life. We pray he would follow his maternal grandparents in knowing & loving the Lord. And we pray that the birth parents would also somehow come to know the Lord in a deeper, more real way. Please continue to keep us & our family in our prayers. Dan still has to finish grad school so that he can graduate in May (on his birthday). We still have work responsibilities that we need to come back to at some point. We still want to have children and still believe God has called us to adoption. We are okay. We are not wonderful. We are not happy with what happened. We still feel broken & discouraged at times. It will be a while before we are fine. But we are okay. We feel the power of your prayers & the peace of God’s presence. We went away this past weekend & Mother’s Day. We are making plans for our 5th anniversary in August. We are not returning any gifts. We have moved a few items that were in the way in the living room, but we are keeping our house as is, with nursery door open. And we have turned in our paperwork with our adoption facilitator so our profile can be shown again; we have a 5 year contract with them & have paid the majority of our fees for their services = We are “paper pregnant” again. We would love to be matched again quickly & for a short amount of time with the baby that God has planned for our family, but our hope is in God & His perfect time & plan. It is with great joy that we can finally share that “He has done it!” In God’s perfect timing, we have been matched privately with a baby BOY who is due April 2! While we have been in the adoption process for over 2 years and while our profile was shown over 50 times this past year, God has made it clear that THIS is the baby He had in mind for us all along. We are so grateful for your prayers, support, & encouragement throughout our adoption process, and we hope you will continue to keep us in your prayers. Several weeks later after more conversations through email, we met with both the birth mother & father over dinner. We again had a great time together & connected with the father who we met for the first time. After discussing some important details & plans, everyone was in agreement that we should move forward with the adoption! We decided to tell our siblings at Christmas by giving them special picture frames with “cousins” or “family” to make our special announcement. Because this will be a private adoption, we will not have matching fees to pay through our facilitator! We will, however, have legal fees that we will pay to our attorney – a strong Christian who worked with Dan’s parents in their adoptions & is also an adoptive parent himself. He will take care of many details like contacting the hospital regarding their adoption policies, working with the parents to develope a birth plan, and informing us of any birth parent expenses. Because we have already paid a major portion of the agreement fees with our facilitator and have a 5 year contract with them, it is very likely that we will do a 2nd adoption in the near future! We praise God for His abundant provision & perfect timing! We have truly felt His goodness & faithfulness throughout our adoption process, and we are so thankful for the love, support, encouragement, generosity, & prayers of so many people. Please continue to keep us in your prayers as we arrange details, prepare our hearts & home, and wait to bring our little boy HOME! 1. Choose life and value the sacredness of the precious life they are carrying. 2. Awe in knowing their baby is loved and known by God Himself. 3. Salvation from their sins and trust in the Lord as their Savior if they don’t already know Him. 4. 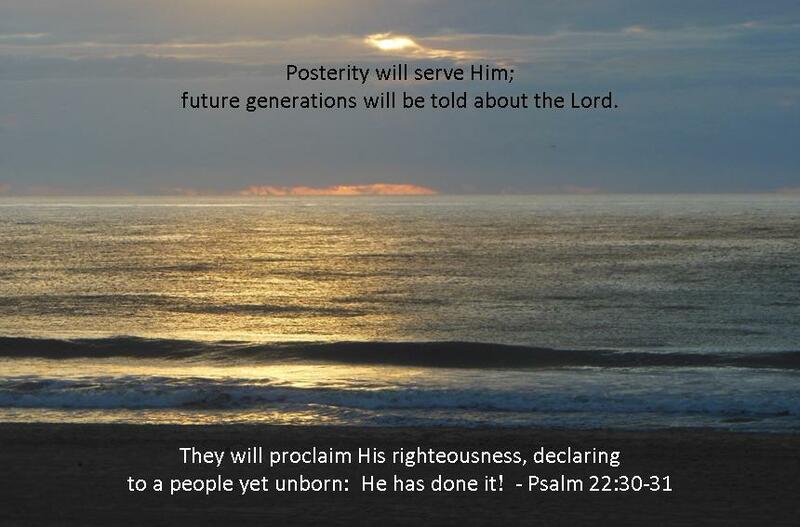 Wisdom as they seek the Lord’s will in choosing adoption or other options for their baby. 5. God to supply their physical needs and provide peace & rest during this uncertain time. 6. Open hearts to listen to wise, godly advice from pastors, counselors, & our adoption facilitator. 7. Wisdom in setting up an adoption plan and choosing the right family for their baby. 8. Love and support from their family members and friends in seeking God’s best for the baby. 9. Joy, peace, and strength as they follow through in their adoption decisions. 10. Favor in choosing us to raise their baby. 11. Comfort, peace, and healing as they move ahead with the adoption and life without parenting their child. 12. Wisdom and skill for the doctors during prenatal care and delivery. 13. Health and safe delivery without complications or problems. 14. Physical, emotional, developmental, and spiritual growth with God and man. 15. Faith in Jesus as his/her Savior at a young age. 16. Learn to love God’s Word and diligently memorize it. 17. Desire to follow the Lord and serve Him his/her whole life. 18. 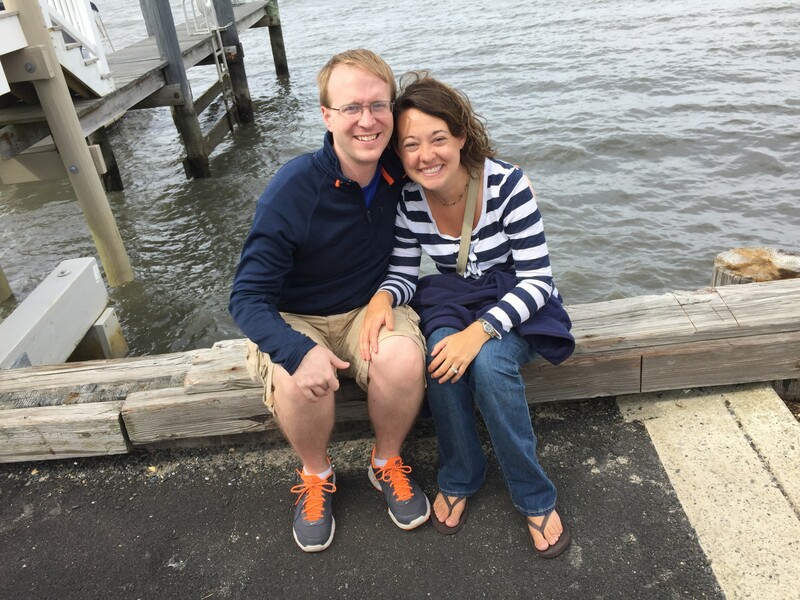 Be a light to unbelievers, especially in sharing his/her adoption story. 19. Strength and patience as we wait for the Lord’s perfect timing to match us with a baby. 20. As we prepare our hearts & home for our baby, we will also look to the Lord’s return. 21. Trust for the Lord to provide financially and that He would bless our fundraising efforts. 22. Surrounded by friends & family who support us through encouragement, generosity, and prayer. 23. Growth & enjoyment in the blessings of life, marriage, and ministry, not simply waiting for the day when we are blessed with children. 24. 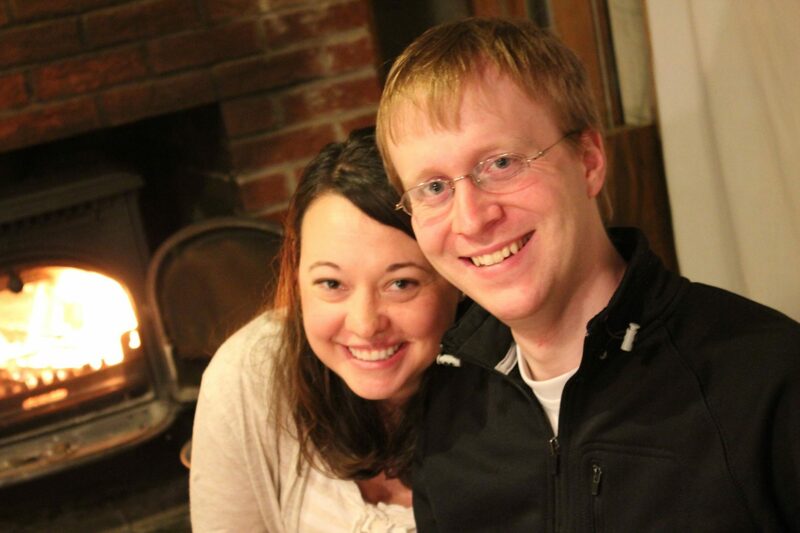 Our adoption story to show God’s love in adopting us into His family. 25. Desire to see God glorified in the greatest way when He brings about our adoption. 26. Quick bonding and attachment with our baby. 28. Faithfulness in teaching our children about the Lord. 29. Faithfulness in serving the Lord as a family. 30. Diligence in continuing to live out our family’s godly legacy. Be a piece of our adoption puzzle! $18. That’s all it will take to be a part of our next adoption fundraiser! We created this beautiful puzzle with a picture from one of our favorite vacations (Ocean City MD) and the Bible verse (Psalm 22:30-31) that God has laid on our hearts for our adoption! This frame will be displayed in our baby room and bear witness to all that God has done for our family! Anyone who makes a donation will have their name written on the back of this puzzle, which will be framed between 2 piece of glass (so all the names can be seen from the back). This fundraiser will help cover a majority of the estimated costs for legal fees, birth parent expenses, and travel/lodging when we go to meet our baby! We ordered a 252 piece puzzle from Shutterfly. Why 252 pieces? Because the only other option was a 60 piece puzzle…which would have raised the individual amount for donations to be a lot more than what the average person could afford to donate. With 252 pieces, more people can be a part of our adoption, and we thought that $18/person was doable for most individuals. We reached our matching grant! We are so excited to see how God has provided for our adoption! 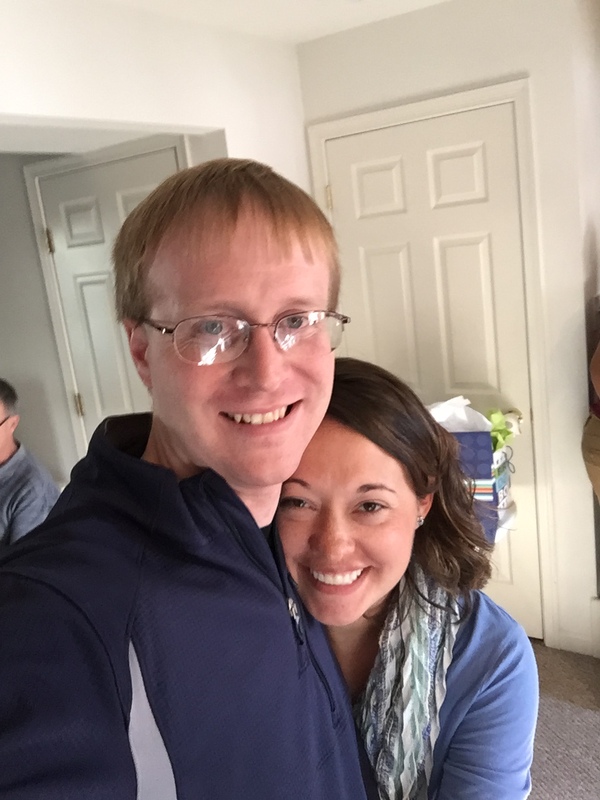 On New Year’s Eve, we found out that we met our $2,500 grant through Lifesong for Orphans! In fact, we have actually surpassed our goal and have raised over $3,364.77 through this account! Because this is a matching grant, the $2,500 is doubled to $5,000—which will cover the matching & placement costs through our facilitator, the Adoption Center of Hope, in CA! Our profile has been shown several times to expectant moms! In November, we received an update that 3 birth families who are interested in us are in their 3rd trimester and are due by the end of March; one lives in the Mid-West, and 2 live in the West. Our profile was shown again several times in December. 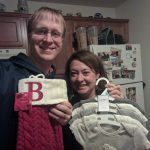 We are very hopeful that we will hear something soon and be matched with our baby! In the meantime, we continue to plan and prepare for our baby, who we hope to meet in 2016! 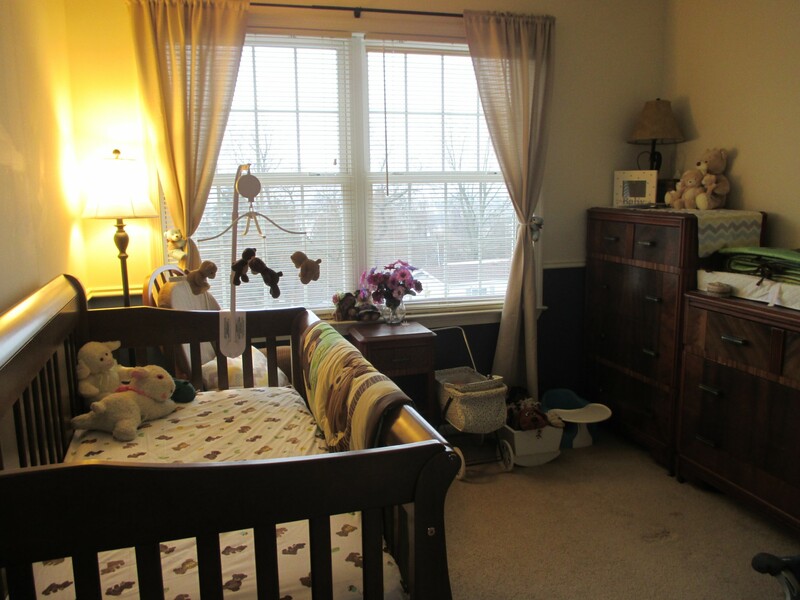 Our nursery is coming together, and we have been blessed to receive several donations to furnish our baby room. We are hoping to have a fundraiser at the local Chick-fil-a in February or March. We hope to raise a total of $14,000 for our adoption expenses. While we are very excited to have reached our matching grant with Lifesong for Orphans, we still need to raise additional funds for our adoption. So far, we have paid $4,100 towards our $8,250 agreement fees with the Adoption Center of Hope. But we have several unknown expenses that we will need to pay in order to bring our baby home. We estimate that we will need an additional $2,000 for birthparent expenses; $2,500 for travel expenses, lodging, and food; and $4,000 for legal fees (for attorneys in PA & the state in which our baby in born). We will also need to pay around $500 for the finalization fees to our adoption agency, COBYS Family Services, which will be due around 6 months after we bring our baby home. Please continue to pray for us throughout our adoption process! The wait can be very hard at times, and it is easy to be discouraged or feel forgotten. We are trusting that God will answer our prayers & bring our baby home in 2016! 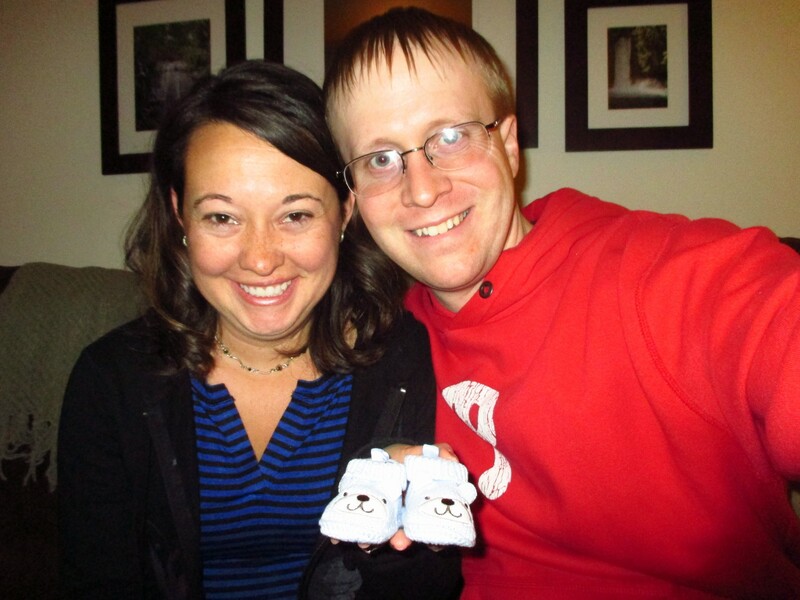 Join us in praying that Baby Marks will come home in time for Easter! Thanks so much for your prayers & support!